This is my absolute favorite time of year. Where I live it’s gone from hot and humid 90° weather to about 70° with a chill in the air. I just love this. I am basically surrounded by trees and they are just beginning to change colors. There is just a bit of yellow and orange beginning to show in the tree leaves. It’s only a matter of time before they turn red and then begin to fall. What other season change is full of such beautiful warm colors and cozy weather? So, in honor of my love of this time of year, I have inked up a Laban Mento in Autumn flake with Private Reserve Orange Crush. If it’s Autumn outside it might as well be Autumn in my office, right? The color is a fantastic autumn-y burnt orange. The color does change a bit when it come in contact with air and/or when it sits in the feed for a while. This means that when you first start writing, the ink starts out a bit brown and then changes to the orange-y color as you continue to write. I happen to love this color variance, but I understand that others may not. 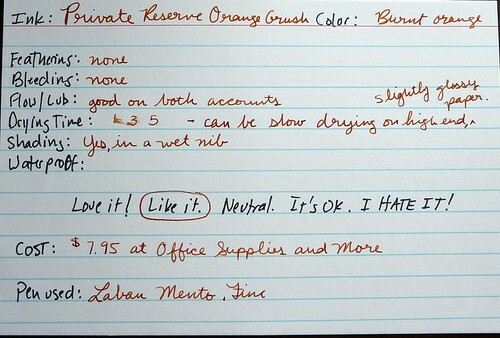 PR Orange Crush is very well behaved. I’ve observed no feathering and no bleed through. The flow is generous, but it does give the pen a bit of a dry feel, so the lubrication could be better. Now one major drawback to this ink is the dry time, it is incredibly slow drying on papers that have a slightly glossy finish ie Clairfontaine, Rhodia, Exacompta, etc. If you are using an absorbent paper, like inkjet paper, the drying time is not bad. All in all, I really like this ink. If something could be done about the drying time I’d be in love with it. As is, it is a perfect Autumn ink. Have you switched over to an Autumn ink? If so, what is it? I like the review card. The ink look nice, no smudge. 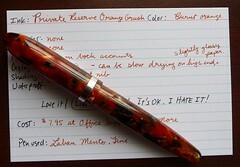 For that price, this is a very nice fountain pen. I am just beginning to collect fountain pen, so far I have a Stipula Passaporto, a Lamy Vista (green) and a Franklin Cristoph (the best so far). You have a nice handwriting.